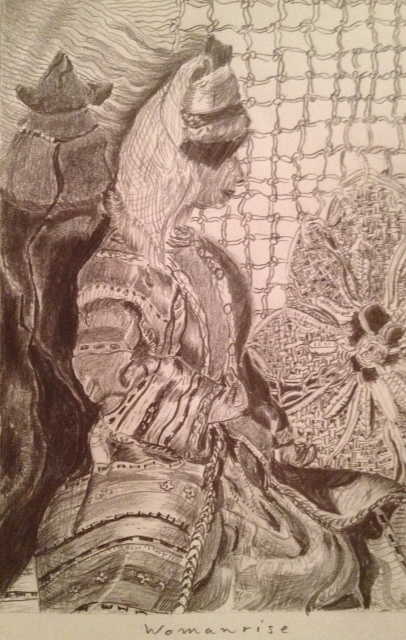 A 4″ x 6″ graphite drawing on Canson sketchbook paper of a doll made into a scene using lace and a sheaf from a pine cone. not to do that but defocus from the ball itself and take in an expanded picture of the scene. Do you remember those computer created pictures that at the surface showed only repetitive patterns, but if you looked at the surface, not with your usual direct intent, but looked at the surface halfway, defocused, suddenly a stunning 3 dimensional image appeared? I think it goes pretty well with your description of seeing auras.I have always thought an interesting exercise was to look halfway towards and halfway beyond the person or object, thus defocusing the person/object itself, but then seeing it clearly!